The aim of the Horsham Circle of Life Festival is to enrich the heart of our community and bring people together to celebrate life. There is a strong focus on honouring and respecting our planet, leading to a more connected life-style. This series of highly creative events is not for profit and is designed to include families and people of all ages within our multi-cultural society. The Festival will be opened by Cllr Kate Rowbottom with a ceremony led by Jean Francis, to honour elders in our community. Join us for music, song and story-telling to feed the soul; songsmith and vocalist Razia Aziz, story-teller Chris Corps, and he Brighton & Hove Interfaith Choir. You will be served with tea and home-made cake, which is all included in the price of the tickets. This event will include a raffle in support of our local Elders via Age UK Horsham District. Venue: The Drill Hall, Denne Road, Horsham, RH12 1JF. This is a ticketed event and all tickets are inclusive of refreshments. Tickets are £11 each (Early Bird only £10 before March 31st). Make it a family/friend special event & book your own large circular table, seating 12 people – only £120. (Early Bird table booking only £110 before 31st March). A Service to Celebrate the Circle of Life: Led by Rev Professor June Boyce-Tillman, MBE, Professor of Applied Music at Winchester University and Honorary Chaplain of Winchester Cathedral. Tea & Coffee. A Multi-Faith Day with an Indian Flavour: Bring your own packed lunch to this full day’s event with Inspirational speakers, music, bhajans and a ceremony of common Union led by Christopher Snelling and Lyn Baylis. Venue: Ellen’s Green Memorial Hall, Fursden Lane, Ellen’s Green, RH12 3AR. Walking Life’s Path: The labyrinth walk is a metaphor for the journey to the centre of your deepest self and back. It is a path of quiet reflection, a walking meditation, led by Felice Rhiannon who is a certified facilitator and our guide in the journey to the centre and back again. Bare feet or socks only on this special canvas please. This event will be enhanced by the riverside walk which follows immediately. Venue: North Heath Hall, St Marks Lane, Horsham, RH12 5PU. Donation to cover costs appreciated. Riverside Path; Mindful Walk: This walk will complement the Labyrinth walk as participants expand into the outdoors, along the Riverside Path for a guided mindful walk. Our purpose is to be in the present moment and to let go of anxieties and worries and to experience peace. This walk, led by Jill Shuker, former Horsham Healthy Walks Leader will also be gentle and relaxed. Meet at North Heath Hall, St Mark’s Lane, Horsham, RH12 5PU. Wed. June 1st: 2 – 4.30pm. Teenage Textile Creations – Upcycling Workshop: An opportunity to exercise the imagination, and for teenagers to learn the art of textile upcycling. During the session we will discover the power of our own uniqueness and dispel the myth that beauty can be purchased through fashion. Workshop run by Carrie Cort, www.sussexgreenliving.co.uk, Winner of the Green Champion Award at the BBC Surrey & Sussex Community Heroes 2015, along with help from others. Venue: Park Barn, Horsham RH12 1LR. Tickets £5.00 (Booking essential for this creative activity). Thurs. June 2nd: 10.30 – 4pm. Life Beyond Death Workshop: Martin Nathanael speaks about his own near-death encounters, ancient teachings about the soul’s journey into wholeness, the stages of transition and much more. Tea and coffee will be provided. Venue: Park Barn, Horsham, RH12 1RL. Tickets £35.00 (Early Bird only £30 before March 31st – Concessions available). The Healing Power of Sound: Sound has many healing properties. Join us to experience the wonder of sound played on crystal bowls and discover how to really listen to music on a deep and healing level with Christopher Snelling. This will be followed by an organ recital to further experience the value and beauty of sound in this new way. Venue: St Mary’s Church, Causeway, Horsham, RH12 1HE. Donations towards costs will be appreciated. 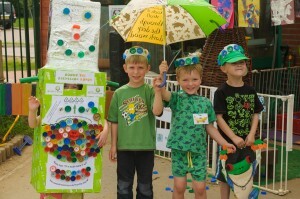 Kid’s Green Play and Display: A fun filled afternoon which will educate and inspire children about the value of waste resources. Lots of exciting upcycled games, meet Ronnie the Robot and Landfill Larry, run the recycling race, enjoy a display of inspirational upcycled clothes, accessories and bags, made out of what some people call rubbish! There will also be a DVD, CD and book Swap Shop, bring one, take one. The session is led by Carrie Cort: www.sussexgreenliving.co.uk, Winner of the Green Champion Award at the BBC Surrey & Sussex Community Heroes 2015. Bring a picnic and make a day of it! Children must be accompanied. 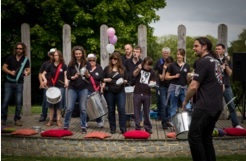 Venue: The Human Nature Garden, Horsham Park RH12 1RL. Rock ‘n’ Roll Cream Tea: The closing ceremony in partnership with Cancer Research, includes a healing ceremony led by Nickie Allan and Neil Giddins, with Judith Silver and the harmonious tones of Companion Voices. It is an opportunity for those touched by loss, to remember loved ones during a candle lighting ceremony and celebrate LIFE. Ticketed Event: All tickets include tea and home-made scones with jam and cream. Tickets are £12.50 each (Early Bird only £11.50 before March 31st). Make it a family/friend special event & book your own large circular table, seating 12 people – only £137.50 (Early Bird table booking only £125 before 31st March). This entry was posted in Children & nature, Events, Green art & games. Bookmark the permalink.